Our Open Windows page is designed to ensure accountability and transparency in our operations as a state-funded provider of brain injury services – in other words, to provide an open window into our activities! 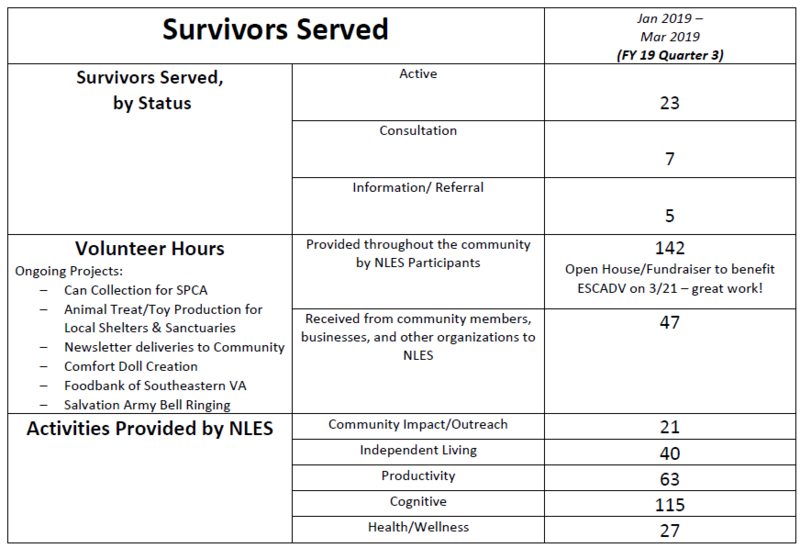 The graphics/charts below provide information on the numbers and types of activities at No Limits Eastern Shore, as well as how many individuals we have served, how many hours of volunteer service our participants have provided in the community (and how many volunteer hours the community has provided to us), and other significant events for the quarter. 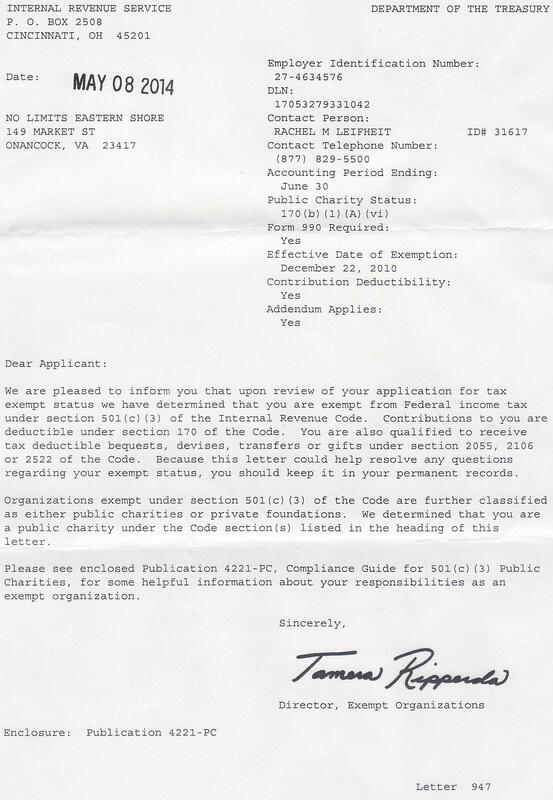 We also provide our 501(c)3 charity and other related documentation here. *The graphic above displays the most recently completed quarter of Fiscal Year 2019 only. **The NLES Consumers Served Report is updated at the end of each quarter. 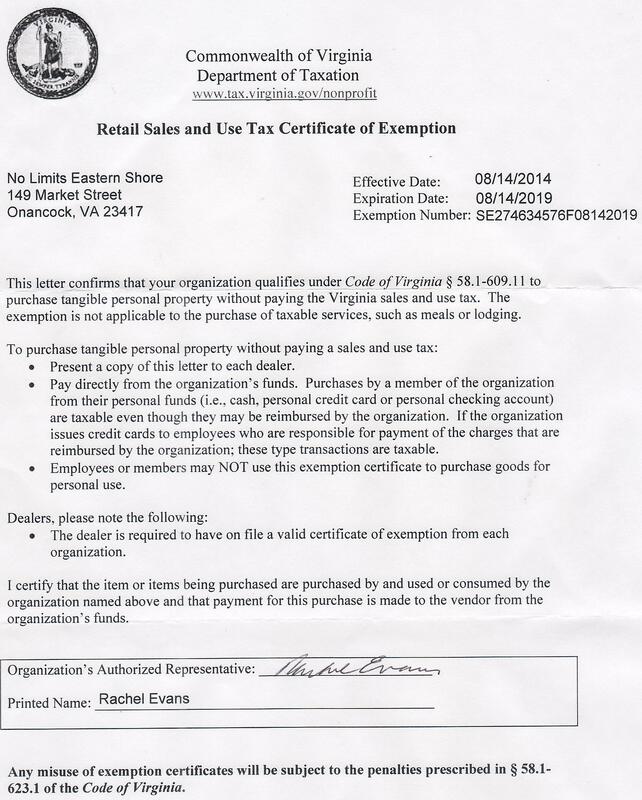 Please check back in July 2019 for Fiscal Year 2019 Quarter 4 totals. ***Full, complete, and archived Consumers Served Reports for Fiscal Years 2015 – 2018 may be found below on this page under “Archived Consumers Served Reports”. Active Attending day program actively with all intake paperwork completed. Consultation Not enrolled as an active member but requiring ongoing consultation exceeding 15 minutes per quarter. Information/Referral Individual (or representative) who has made contact for information or referral services requiring less than 15 minutes per quarter. Independent Living [I] Activities such as shopping, cooking (not for charity), cleaning, and yard work where the primary purpose is to promote independent living skills. Community Impact/Outreach [O] Visits to shut-ins/long term care facilities, newsletter deliveries, participation in meetings/seminars/information fairs and other similar activities where the primary purpose is outreach to the community. Cognitive [G] Puzzles/games, speakers and other group activities with the primary focus on thinking, attention and memory skills. Productivity [P] Volunteering in-house (i.e., comfort dolls, outreach cooking, animal shelter treat making, etc.) or in the community (Hospice, Salvation Army, street cleanup, etc. ), recycling, gardening, and similar activities where the primary function is productivity. Health/Wellness [W] Exercise, gross motor games, walks, safety meeting, Health Advocacy Training, speakers on health related topics, and other similar activities with the primary focus on health and/or wellness. These totals are then scored on the main DARS website using their Brain Injury Services (BIS) Programs Scorecard. To view the quarterly and annual scorecard for any BIS Program through VA DARS please click here: http://www.vadrs.org/cbs/apps/outcomes/ . For assistance in understanding or interpreting the DARS Scorecard report please contact us at No Limits Eastern Shore.